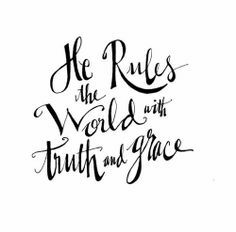 “He rules the world with truth and grace, and makes the nations prove….” (“Joy to the World“) will ring out again this Christmas. But, does “He”? Isaac Watts‘ Christmas carol celebrates faith in the future by looking back at the most unlikely of places: an animal feeding trough, a manger, in Bethlehem, on the outskirts of the Roman Empire. In 2017 it’s hard to sing. In too many ways, it’s not true. Not yet. Herod’s search for the child, Herod’s lies and the slaughter of children that led Mary and Joseph to become refugees in Egypt feel more familiar than the rule of grace and truth. The nations do not prove the glories of His righteousness or the wonders of His love. The world continues to be ruled by deception and greed. Even so, whether singing “Joy to the World” or listening to Handel’s Messiah, as Martha Ann Kennedy shared in her “The Messiah” post, we sometimes find ourselves going where only music takes us — the longing of the human heart whose aching seems to echo a promise that evokes it, a subjectivity inspired by a longer objectivity, as it were — the victory of goodness over evil, beauty over ugliness, and truth over falsehood. The curse is not yet removed, but it is countered by a promise and a command: the hope for the rule of grace and truth over the nations. It falls to us to act responsibly in the face of the sins and sorrows that still grow, the thorns that infest the ground and threaten the planet; to be channels of truth and grace through which His blessings flow, far as the curse is found. Gordon C. Stewart, Chaska, MN, Dec. 22, 2017. This entry was posted in Life, music, Spirituality, Uncategorized and tagged he rules the world with truth and grace, no more let sins and sorrows grow, the wonders of his love, truth and grace by Gordon C. Stewart. Bookmark the permalink. Glad you enjoyed the post, Carolyn. Thanks for the re-blog, Karin. Merry Christmas to you and Don. Thank you, Martha. I wish you another Handel moment and peace and joy in the new year.